The EgyptAir crash that killed 66 people in 2016 was probably caused by a fire in the cockpit, according to French investigators, citing black box recordings. Initial findings of TNT traces suggested the crash may have been caused by an onboard bomb. EgyptAir Flight 804 (MS804/MSR804) was a regularly scheduled international passenger flight from Paris Charles de Gaulle Airport to Cairo International Airport, operated by EgyptAir. On 19 May 2016 at 02:33 Egypt Standard Time (UTC+2), the Airbus A320 crashed into the Mediterranean Sea, killing all 56 passengers, 3 security personnel, and 7 crew members on board. No mayday call was received by air traffic control, although signals that smoke had been detected in one of the aircraft’s lavatories and in the avionics bay were automatically transmitted via ACARS shortly before the aircraft disappeared from radar. The last communications from the aircraft prior to its submersion were two transmissions from its emergency locator transmitter that were received by the International Cospas-Sarsat Programme. 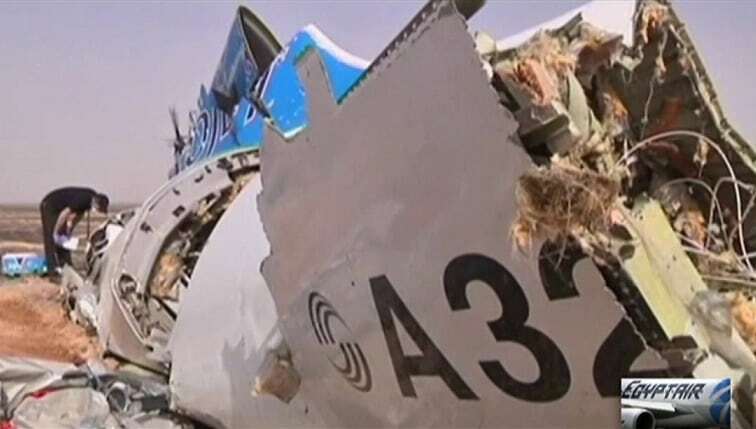 Debris from the aircraft was found in the Mediterranean Sea approximately 290 km (180 mi) north of Alexandria. Nearly four weeks after the crash, several main sections of wreckage were identified on the seabed, and both flight recorders were recovered in a multinational search and recovery operation. On 29 June, Egyptian officials announced that the flight data recorder data indicated smoke in the aircraft, and that soot plus damage from high temperatures was found on some of the wreckage from the front section of the aircraft. The aircraft involved was an Airbus A320-232, registration SU-GCC, MSN 2088. It made its first flight on 25 July 2003, and was delivered to EgyptAir on 3 November 2003. The aircraft was powered by two IAE V2527-A5 engines. The flight was the aircraft’s fifth that day, having flown from Asmara International Airport, Eritrea, to Cairo; then from Cairo to Tunis–Carthage International Airport, Tunisia, and back. The final completed flight of the aircraft before the crash was Flight MS803 to Paris.